After years of working at conventional architecture firms, followed by a sabbatical as a stay-at-home mom, Margaret Gaughan Upton parlayed her experiences into a new architectural design concept. In 2009 Margaret established Upton Architecture; a consortium of independent architects and interior designers who seek a balance between work and home. Operating from home based offices throughout the DC area, Upton Architecture offers clients a full service architectural practice with lower overhead and a smaller carbon footprint. She and her talented group of designers use the knowledge of what it takes to juggle family and career to create beautiful, efficient, and comfortable homes for their clients. The “world headquarters” is in Kensington, Maryland’s Parkwood neighborhood where Margaret is your first point of contact and is with you through to completion. A knowledgeable and personable leader, she understands her clients’ needs and rolls up her sleeves to provide contractors support to keep the project running smoothly. 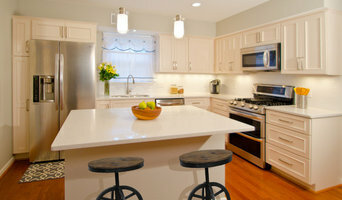 Upton Architecture serves clients throughout Maryland and the District of Columbia. Susan Feffer Interiors transforms spaces using current design trends by updating the aesthetic look and feel of the home. This process is unique to every client depending on individual taste and needs. In some cases, the project might start with the daunting task of purging old pieces, de-cluttering rooms, and deciding what stays and what goes. Having a “second eye” assist clients with this grueling process not only motivates them but also helps them to determine what stays and what goes. Before a design plan is created, it is essential to identify what the client has to work with in a clean and uncluttered environment. Once this is accomplished, a design plan is created and the fun begins working to complete the design goals! Susan Feffer recognizes that not all clients need as much assistance as others. Many clients share her love of decorating and the creative process of transformation and design but simply don’t have the extensive resources that a designer or decorator can provide. Susan Feffer’s clients will benefit from all design professional’s resources, such as access to the design center, trade only wholesalers and manufacturers, and local retail stores. The overall design plan may include all or some of design elements including new paint, furniture, wall coverings, carpet/flooring, window treatments, reupholstery, lighting, and accessories. These selections will be based on how the colors, textiles, lighting, and furniture interact and transition with the overall design and decor of the home. The ultimate goal of Susan Feffer Interiors will reflect functionality, taste, and lifestyle of every client and stay within their desired and budget. But before you start sending out dozens of emails and making phone calls, sit down and think about your project. What's your budget? What is the scope of your project? Will you need more than one type of professional to complete your home improvement project in Kensington, MD? Can you afford to complete the full project now, or should you tackle it bit by bit? Once you've settled on your project’s priorities, budget and scope, it's time to start researching Kensington, MD home design professionals. Don't sell yourself short and settle on the first professional you set your sights on. Make sure that you're working with someone local, who can get to the jobsite easily and efficiently. Look into the person’s reviews, ask to speak with former clients and to see previous jobs in person. Take a good look at their portfolio photos: How similar are these projects to your own? Be honest — that mansion might look beautiful, but it might not have a lot in common with your little bungalow. Reach out to multiple professionals — especially for larger projects — and don't settle for the first bid you hear. Comparing multiple Kensington, MD professionals' bids and experiences can help you find the one that’s best for you. Ask a lot of questions now, so you won't have unexpected answers later. Find a home design professional on Houzz. Narrow down your search by type of professional and location. Browse Kensington, MD portfolio photos, read client reviews and contact each Kensington, MD professional for more information. Check out the information in the specialized professional sections too for tips on how to hire the right professional for your project.